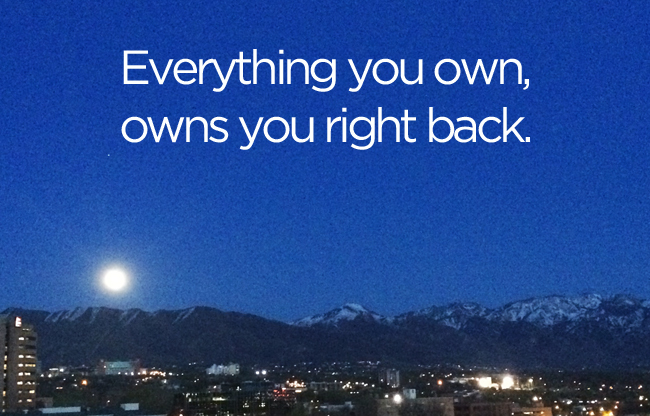 You may own your stuff, but it owns you right back. It owns your money, your time, your attention, and space in your home. I dress with 33 items or less and have lived with fewer than 100 personal items, but don’t believe owning less than a specific number of things will make you happier or make your life better. The number is not important. It is important however, to understand the impact of things you buy, own, and take care of. Owning something might be a complete waste of money and time, or it might bring joy and value to your life. 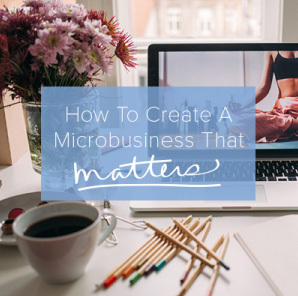 I own a laptop and it allows me to work from anywhere and connect with people everywhere. That = joy and value. I also own beautiful art that hangs on my walls. It’s not necessary, but it makes me smile. That = joy and value. Owning less allows me to fully appreciate the things I do have, and it also reminds me that I don’t need much to be happy. Have a yard sale or list the stuff you don’t use or appreciate on eBay or Craigslist. Remember that all of these channels take time, so if you don’t need the money, or selling the item isn’t worth the time you have to invest, give it away. Instead of feeling guilty for spending so much or holding on so long, remind yourself that you have paid enough and let it go. 3. Practice one in, one out. To prevent clutter creep and really think about your purchases, commit to donating one item for every item you bring home. If you aren’t sure if you need or want something that you already own, hide it in an unmarked box for 30 days. If you don’t remember what’s in the box, give it away. Joshua Becker invites you ask 3 questions before making any purchase. Read this to find out what questions you should be asking before purchasing clothing, furniture, food and other items. The Minimalist Game. Find a friend or family member. Someone who’s willing to get rid of some of their excess stuff. This month, each of you must get rid of one thing on the first day of the month. On the second, two things. Three items on the third. So forth, and so on. Anything can go! The Reverse 100 Thing Challenge. The point of the 100 Thing Challenge is to live with 100 things. The Reverse 100 Thing Challenge invites you to dump 100 things. If you’ve always thought that the 100 Thing Challenge is extreme, and that it would be impossible to only live with 100 things, then giving away only 100 things should be a breeze. Project 333. Challenge yourself, along with thousands of people around the world to dress with 33 items or less for 3 months. 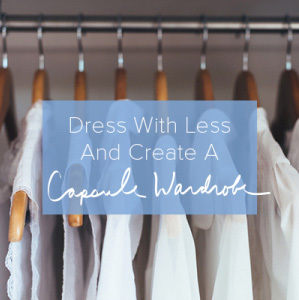 It may start in your closet, but dressing with less can change every area of your life. 7. Get rid of your duplicates. Those buy one, get one sales may have been too good to pass up, but now you have two of everything and you aren’t even sure if you need one anymore. If it’s too hard to let them both go, keep one, and give the other away. 8. Don’t look for happiness at the mall. Shopping and spending may give you a momentary happiness boost, but it doesn’t last long. Instead of looking for happiness out there, find it from the inside-out. Give away your books and go to the library when you want to read something new. Instead of shopping for new fashion, host a clothing swap. Sell your car and use a car sharing service like Zipcar. Trade your work. Colin Wright offers design services to restaurants or coffee shops in exchange for food and coffee when he travels. Every time I think something has a hold on me, I realize I’m the one with the tight grip. The first step to letting go is loosening the grip. When you think about the money you spent to purchase and protect what you own, what you spend to maintain it, the time you spend cleaning it, worrying about it or organizing it, and the energy it costs just to have it around, you’ll discover that letting go is easier. Own what you want, but always remember, it owns you right back. I just want to thank you for your wonderful blog! A few month ago, I discovered you, project 333 and all the other wonderful things that you offer here. I started to realize how much junk I had, clothes that I never wore, never matched, or hated wearing, jewelry that mad me sad, ect. I stared giving/selling/throwing away so many things that I didn’t even know I had! I would walk by the same cabinet every day, but I never saw that little clay figure that I had made as a child sitting on the bottom shelf. When I realized that I didn’t even knew I had it, and that it didn’t bring me any joy, I took a picture of it, then threw it out. one, I might need one of these items some time and if I throw it out, I’ll have to get another one, and, two, I have really fond thoughts of this item and I don’t want to part with those feelings. I love the idea that the things you own, also own you right back! So true! Jill … getting rid of an item doesn’t mean you have to get rid of the fond feelings. I have a friend who has taken pictures of items that have fond memories associated with them, perhaps that may work for you too? Jill – I’ve let go of some “fond” type items by taking photos of them. There are some where I don’t need the actual thing; a picture is good enough and evokes the feelings 🙂 This is especially true with awards and items gifted to me. Others I’ve kept because I LIKE having the actual item. I also struggle with the “might” need it…there are a lot of things I do use, just not daily or even weekly, but that have no substitute. I’m okay with keeping things that don’t have a close substitute and that I’d just have to re-buy if I need them again (the reason I own them in the first place is because I’ve needed them before…often more than once). I’ve concluded that not everyone is meant to be a true minimalist, although I’m always trying to work towards having less than I do now. Best to you! Hi everyone! Thank you so much for the ideas and the support. I’m going to try all the suggestions! Struggled with this topic too but did it anyway (not all but most of them) and… – the thoughts remain. I can go to the memory whenever I want to without the item it’s related to. What always helps me is: some day we have to leave and all we can take with us is experience and the love we gave. Keep calm and carry on! You will find your way. Sometimes, when I’m reluctant to let go of an object but have considered parting with it before, that’s my sign that I don’t really need it. So I ask myself, “do I really love this? Would I miss it if it were gone?” And then I walk through my house to stand near something that I really do love (the pottery from our wedding, or a favorite piece of art) and I can feel the difference – the items I’m really attached to aren’t the ones to which my eye travels when it’s time to let some things go. It sounds a bit hokey, but it helps. The more I get rid of the lighter I feel. I have never regretted anything I have sold or given away. I regret all the time & energy I spent accumulating, sorting, cleaning and maintaining stuff. I still have a ways to go but I’m getting there. Thanks for the inspiration and the reassurance. These are all great steps toward a simpler life! I definitely need to work on the one in, one out rule. I have pared down a lot of areas of my home, but sometimes little things start to creep back in. I think I will work on eliminating a few items this week. I also think it’s fun to look at what I have and find new ways to use those items instead of purchasing something else. I’ve been culling my possessions over the past year and a bit, and have been doing things like Project 333. It forces you to use your creativity to do things – I’ve been putting together outfits that I probably never would have worn when I had everything in the closet! My boyfriend and I are also in the process of moving, and have slowly been selling, donating and packing our things over the past month or so. It really makes you question what you need to be happy. It is oddly thrilling and fun to see bare cupboards and empty closets. We are both loving the feeling of freedom that it brings. I’m looking forward to moving into a new place, and instead of unpacking everything at once, only taking things out as we need them. I’m sure we will still find more things that we can do without. Thanks for another wonderful post, as always! Thank you, Courtney for this post! Nr.1 and especially Nr.2 are great to remember for me. I like your Blog much! This post rings so true with me. I have been on a decrapifying, decluttering, minimalizing, simplifying mission since January 1. I never realized how true it is that everything you own, owns you right back. I’ve gotten rid of a ton of things while making the first pass through my cupboards, closets, and rooms. I am finding that it is getting easier to get rid of stuff as I start to make a second pass through every room. Still have the basement and garage to do but just seeing what I have accomplished makes me realize I can do those areas too! Wow! Cleaning out clutter from home and life – I love it! This morning I met my neighbour on a walk with his dog through plantations of blooming cherry trees. We talked about family, heritage and possessions. He said: “What for do we need all the stuff we accumulate over the years? It brings responsibility and can be a burden for a lifetime. When I’m out in the nature I can breathe, I’m accepted as I am and here I find peace and calm – a piece of god. And I wont trade this for 1.000.000 bucks. I don’t own a piece of it but I can enjoy it all.” He is so right! Thanks Courtney for your help! I (we all) appreciate it very much. I just keep finding more and more things to get rid of as the years (years! yes!) go by – this morning I decluttered the two drawers of toys my grandchildren go to when they’re here, since grandson only plays with Lego, now, and granddaughter either wants magnetic letters/numbers or else crayons and a colouring book. The few books in there, too, have been reduced to the present absolute favourites, why hang on to the old stuff they don’t play with any more?! As our kids move on and away, the stored sportsgear is lessening, too, leaving only what we actually use, yay!! I have been keeping the 100 thing challenge for over 14 years now. It is a great tool for creativity and creating a joyful life. 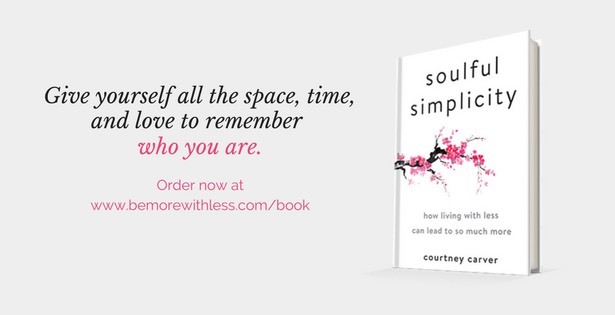 Loved this Courtney – thanks for always inspiring me. “You have paid enough so let it go.” This phrase can be applied to a lot of things. I enjoy your blog – the types of posts and especially your writing voice. This phrase is how I’m feeling lately so I’ll use it for a mantra to do some mental cleaning. Thanks. I am really enjoying reading your blog. One question I have is: what if your spouse isn’t as willing to get rid of the clutter as you are? I’ve been letting a lot more go lately too. It feels good to realize there will be fewer things to drag around in this life, physically and mentally. The phrase ‘owns you right back’ is certainly an important truth. I have been hit with some personal tragedies over the past 3 months. It has devastated me. It triggered a need for me to nest. I started looking at paint colors, curtains, rods, dishes, pillows- you name it, I was in!!! Then I took a deep breath, a few days off and reflected. I am now back on the purging band wagon and I am leaving the guilt and sadness behind. I realized the loss of 2 special people in my life triggered a hoarding sense of things, trying to hang onto things and live through things. Interesting conflict for a die hard simple/minimal liver. Working through the emotions has helped me put the paint brush down. I am still working on some drop cloth curtains and I did buy one can of paint for the much needed kitchen touch up, but I think I have reached my minimal and emotional limit. Curious…I read your 100 things challenge from 2012 and I am curious to know if you are still working within those parameters? I just started Project 333 and I am feeling very inspired by all of this! I also am trying to decide how to handle my craft stuff…knitting, scrap booking, etc…..which I don’t do a lot of anymore, but I am afraid to let go. Much of that stuff has been sitting in boxes for about five years since I went back to school and became a teacher (started career 3 years ago). My job has many crafty aspects that I love so I feel it fulfills many of those crafty needs and I don’t really want to do that stuff at home except for my occasional desire to knit when I watch TV. Just so afraid to let it go I think……my children have benefitted from much of it over the years as I have always shared my supplies with them as needed. But I am soooooooo tired of the clutter and space that stuff takes up! What about bringing your scrapbooking stuff to school with you and setting up an activity corner for your students where they can scrapbook or read books or do whatever hobbies they want when they have some free time or afterschool. That way you can pass along your hobbies to some people that might not be as fortunate. Allison, I also have hobbies and the supplies that go along with it. I think eventually you have to be honest with yourself and ask if you think you will ever realistically return to that hobby. If not, then offer it to your relatives, as you mentioned that they have often been inclined to use your supplies over the years. And that way you could always visit them if you ever needed one if your donated items! If they aren’t willing to take the things off your hands, then I would place an offer on ebay or Craigs list, or donate to a local art center. Good luck! I can really relate with Point 10 – Loosen your grip! It took me a long time before I learned to let go of things I no longer wanted or used because I felt guilty about the purchase in the first place. I tell myself that there is someone who would appreciate the item more than I do and with that it’s a lot easier to get rid of it. I really enjoy your posts and look forward to each of them. I am still struggling with what I want to keep and what I must keep. I find that I love looking through boxes that contain memories from my children. But I have nowhere to keep those boxes but I want the memories. I was photographing the memories but then my digital photo collection got out of hand. Truly there is no easy solution besides just getting rid of. What must I keep. This too continually bothers me.. Will I be able to find that paper when it is all electronic? Ty for letting me share. One that I would add to this list is to take time to appreciate and enjoy what you have. When my kids start talking about the latest toy, I just bring out some of the things we already own that they haven’t played with in a while and suddenly they are having a blast. Same tricks works for me when I want something. We seem to collect more stuff the older we get but much of what we have, we hardly ever use. The older I get the more I realize I don’t need a lot of stuff. What I really want is just time.